The first Russian OTN cross-connector “Volga” performs digital switching of ODU0/1/2/3/4 streams in non-blocking mode with a total capacity of up to 900 Gbit/s. OTN cross-connector provides telecom operator with a powerful tool for remote management of the client traffic allocation over transport optical channels. With the OTN cross-connection, each client port is no more linked permanently to a particular transport channel (as in the muxponder): client traffic can be switched manually to any line interface using the management system, or switched automatically depending on the current load of transport channels. 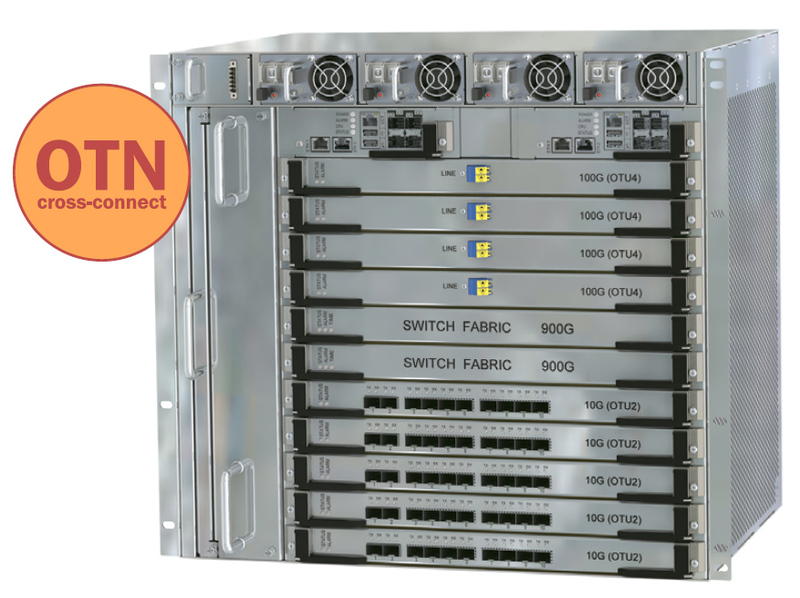 Efficient use of the huge bandwidth of the upcoming super-channels (500G, 1T) is possible only with the use of OTN cross-connectors with digital switching matrix. The device has 11 slots: 9 slots of general purpose for installation of interface cards and 2 slots for installation of cross-connect cards. Two active control units provide robust and redundant management of the chassis. Each control unit has independent control channel to each element of the chassis. Both control units are connected to the management system of the network. The devise supports redundancy 1+1 for cross-connector card, 2+2 for power supply units, and 1+1 for control unit. OTN cross-connector provides full control of separate ODU streams in data channels entering client and line ports (OTU2 - 10G and OTU4 - 100G). Switching granularity is ODU0 (1,25G). Any ODU0/1/2/3/4 stream from any client or line interface can be switched to any other interface. The chassis is managed with the EMS/NMS “Fractal” and with standard network protocols. Reconfigurable optical add-drop multiplexers (ROADMs) can be used for management of separate wavelengths in DWDM network, for example, for their redirection to one or another route. ROADM commutation can be used simultaneously with OTN cross-connection. ROADM enables management of data flows on the level of optical channels (wavelengths), for example, by switching a 100G channel to one or another route of the backbone network. OTN cross-connection enables management of data flows on the level of separate ODU containers, for example, by switching low-speed client data streams to one or another high-speed optical channel.